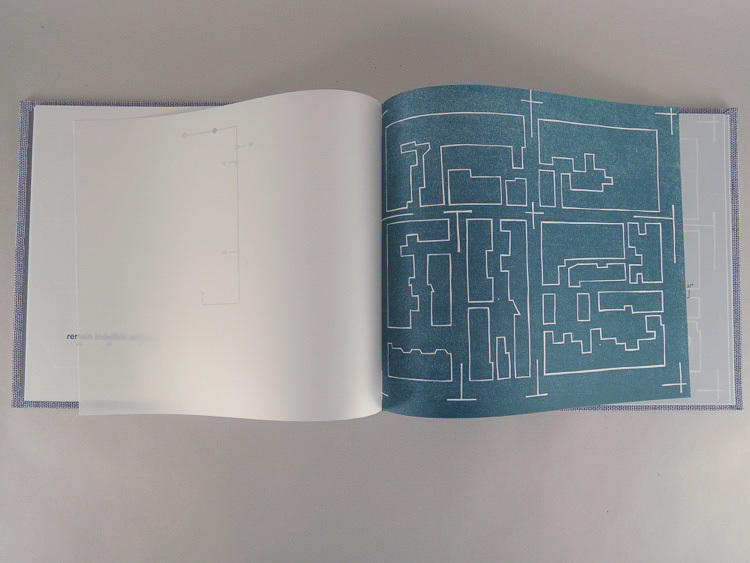 Circuits are pathways, connectors, and occasionally maps. 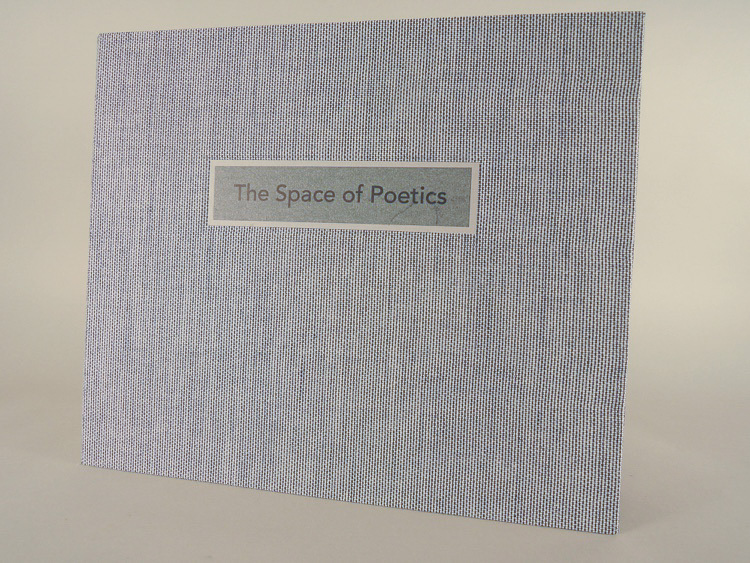 In Sarah Hulsey’s The Space of Poetics, they function as conduits to convey memory. Hulsey constructs a dialogue with architectural theory, specifically Gaston Bachelard’s The Poetics of Space, visually complicating his exploration on how solitude can provoke moments of creativity and thought. The viewer is first presented with Hulsey’s clean, minimal design that expresses her themes. 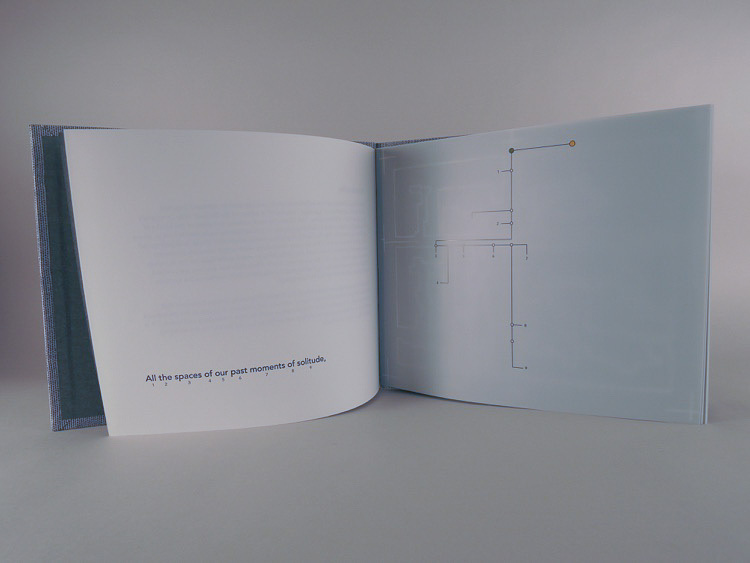 Laid out in a traditional book format, the outer cover is a series of muted grays and blacks. Inside, she alternates between text (always on the left) and mylar and woodcut print (always on the right). The writing is a brief excerpt from Bachelard’s influential work, broken into pieces with numbers advancing upwards underneath each word; the total count of this snippet of text is 101 words. For the right side, the woodcut is an unchanging blueprint of an architectural space, taken from one of the Sanborn Map Company’s Insurance Maps of Philadelphia from 1916. The shapes denote rooms that are closed in and unconnected. The woodcut uses dark blue-green ink, and while it possesses color, it is still quite restrained. 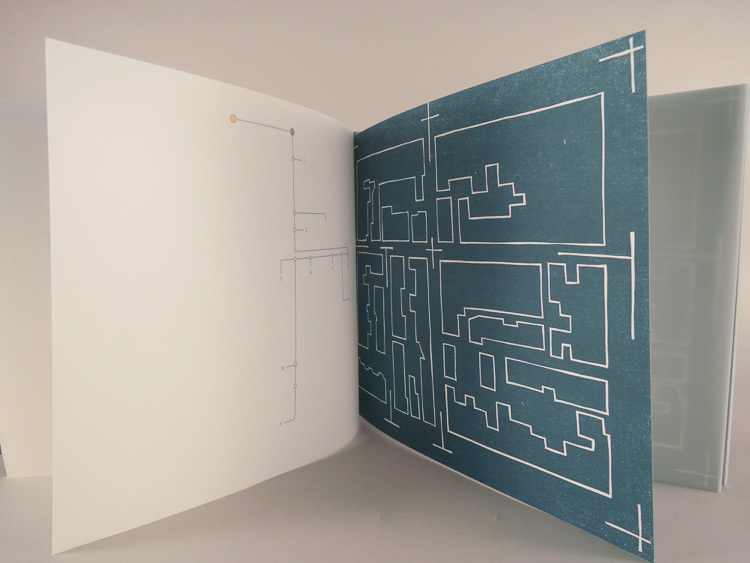 Overlaid on these woodcut prints are single transparent mylar sheets with circuitry diagrams printed on every page, shifting with each succeeding piece. 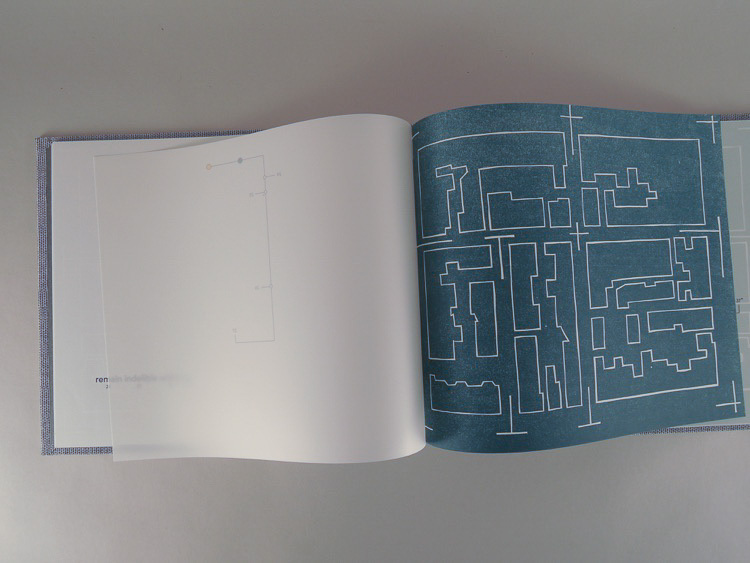 They pictorially organize the numbers from the opposing page by depicting solid and dashed lines showing how the “energy” flows through the spaces. The numbers almost always correspond with solid lines and flow to others. Hulsey’s one exception is 61, which signifies the word “henceforth” in the text piece. 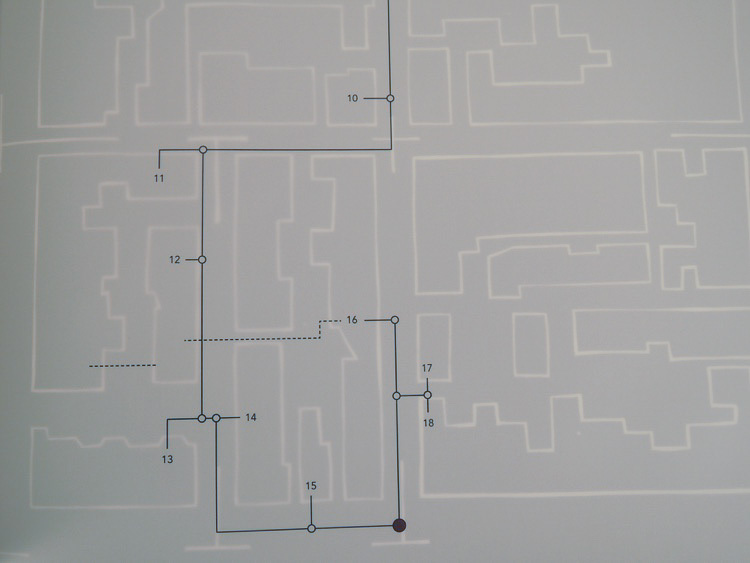 That number’s placement is utterly disconnected from the circuit diagrams—perhaps because, as a piece of language, its function seems superfluous to the rest of the spare yet evocative language of this passage. These outlined circuit changes communicate how language works; in a way, Hulsey’s technique could reference and resurrect sentence diagramming. This bygone art was a method of understanding language to see how each word works within a particular piece of writing. By suggesting these relationships through electricity, Hulsey is able to break Bachelard’s writing from simply grammar and prose to liken it to charged movement. After all, electrical impulses appear as energy in powering our homes and brains. Regarding her circuit design, they are a mix between solid and dashed cables lines; the solid lines could represent a main connection, while the dashed could be an alternate one. 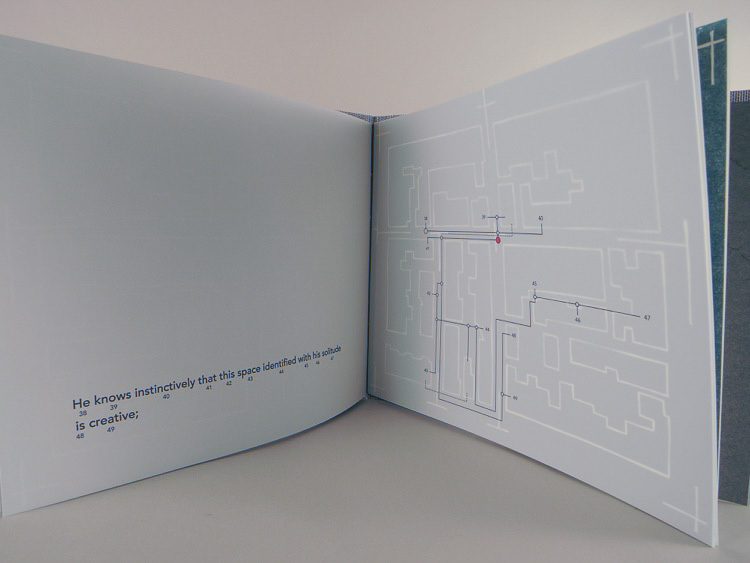 There are also junctions (cables connectors) that are mostly black and white circles, except for some pages that show yellow and red dots. Certain junctions remain from one page to the next, perhaps hinting at how, as we progress through the text and through solitude, creativity erupts from some areas, disappears, and reappears growing in other directions. Hulsey uses the visual language of electricity to hint at other forms of currents, such as neural synapses, which leads to memory. In The Space of Poetics, the currents are a map of neural movement. Examining the Bachelard quote, the text is brief but significant; he discusses how some spaces of isolation allow for flashes of inspiration. 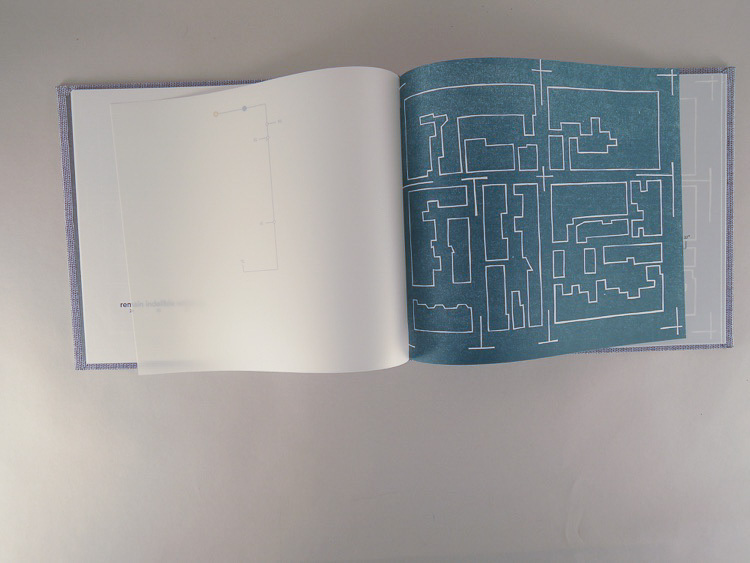 The lack of change of the architectural map over the course of the book emphasizes the electrical mapping transformations, indicating a development of creativity in these spaces of solitude. Removed from distraction and human connections, this moment of being alone gives an opportunity for a person to think beyond the everyday. Rather than be distressed by loneliness, our brains bring charges of inspiration in these quiet places. Even after we have left, this experience clings to us, a means of transporting this insight beyond the walls of our reflective place. Bachelard ends this observation with an acknowledgment that even if there is a loss of this space of seclusion, the memories will linger and keep its meaning alive, though only in our minds. Hulsey’s elaboration on Bachelard feels collaborative as she represents this source material and relates it, visually, to her own art-making and experience. She explores language through various means and discerns how to grapple with solitude and translate that subsequent inspiration. The diagrams and blueprints of a generic place are all languages of their own, however mysterious or just beyond precise understanding. She deftly ties the relationship of memory to these other languages, prompting the viewer to also reflect on their own moments of quiet and possible intersections with these spaces being fertile for creative growth. Hulsey’s careful designs reinforce this feeling of seclusion and peace. While these empty spaces may seem lonely, their lack of stimuli leaves us to our imaginations, lighting up like circuits into brain pathways that will lead to something more in the future. Through enlarging her source material’s world by mapping and dissecting the language, she has created a work that spans science, theory, memory, and especially art. © 2019 Artists' Book Reviews. All Rights Reserved.